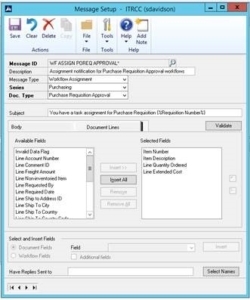 If the Document Lines are not appearing or appearing in the wrong columns in the workflow email, remove the Selected Fields from the message setup and re-add in order. 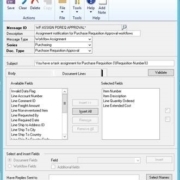 Go to the Message Setup, and remove all of the Selected Fields from the box on the right. Re-add them to the list in the order which you want them. We have noticed this issue arises when you try to reorder the selected fields. https://www.opalbiz.com/wp-content/uploads/2016/08/opalgp.jpg 397 331 admin https://www.opalbiz.com/wp-content/uploads/2016/10/OpalLogo_web-300x101.png admin2016-08-09 13:32:362018-05-30 16:39:08GP Workflow Tip! Opal Business Solutions is a leading provider of Technology Solutions that helps businesses meet objectives and stay ahead of the competition. Our focus is on achieving business goals and removing the obstacles that stand in their way. Using a proven methodology and an array of industry leading products, Opal will design, implement and maintain IT Solutions that reduce costs, increase productivity, and provide value.